Get the app that does it all! Order your favourites fast, from anywhere, and get rewarded! 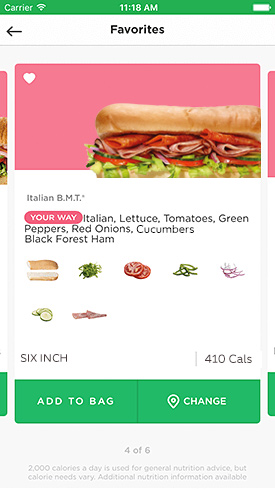 With the app, you'll be a Subway MyWay® Rewards member, so you can earn on all your qualifying purchases, get exclusive offers, surprise rewards and more! Subway MyWay® Rewards available at participating restaurants. For catering, earn tokens on in-restaurant orders only. Tokens may not be earned on purchases of gift cards. Apple and the Apple logo are trademarks of Apple, Inc., registered in the U.S. and other countries. App Store is a service mark of Apple, Inc., registered in the U.S. and other countries.